AES Dublin will be filled with the best in professional audio, from the convention’s main presentation hall to backstage insights into historic facilities in the Dublin area. Open to all badge holders, the AES Dublin Special Events series runs throughout the convention, kicking off with the Opening Ceremonies featuring AES Awards presentation and the Keynote address by sonic interactive design researcher Stefania Serafin. Further events include the AES Diversity and Inclusion Committee’s Town Hall panel and party, a Spatial Electroacoustic Music Concert featuring an octophonic loudspeaker array, the Heyser Lecture given by digital reverb pioneer David Griesinger, and for student member attendees, a student mixer. Also intriguing for attendees are the AES Dublin off-site Technical Tours, taking place on Thursday and Friday of the show. Open to a limited number ticketholders, tours will include behind-the-scenes visits to the national theatre of Ireland – the Abbey Theatre, the 18th-century Chapel at Trinity College Dublin, including a talk on “Church Acoustics and Sonic Heritage”, and a visit to Dublin’s famed Windmill Lane Studios. Technical Tours are made available on a first come, first served basis to anyone with an All Access badge. Tickets can be purchased during normal registration hours at the convention center. 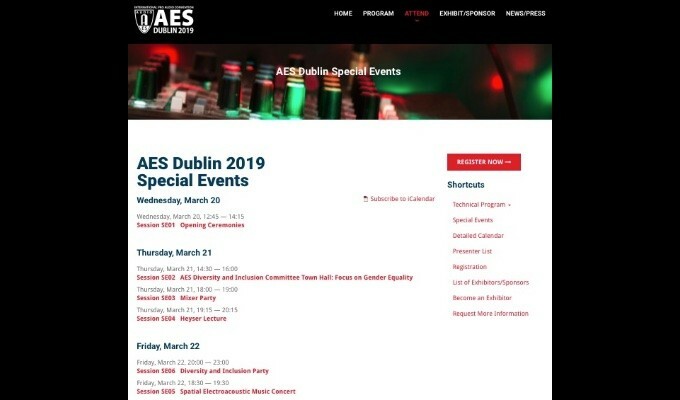 For further information on AES Dublin Special Events and Tech Tours, as well as the comprehensive AES Dublin Technical Program’s four days of intensive audio engineering presentations, listening experiences and social events, visit aeseurope.com. Advance Registration pricing offering significant savings is available through March 18.